Nursing assistant in Mississippi earns an annual and hourly wage of $20,830 and $10.02 respectively as per the data provided by the U.S. Bureau of Labor Statistics. In May 2013, around 15,150 CNAs were employed in the state of Mississippi, and the employment per thousand jobs was 13.98. As per indeed.com, CNA salary in MS was $26,000 (as of January 2015). The salary figures were 5% higher when compared to the average CNA salaries in other US states. If you wish to kick-start a career in the healthcare industry and want to obtain a lucrative salary package, then join approved CNA Classes and acquire certification. 90% of nurse aides made less than $27,430; 10% made more than $27,430. 75% earned less than $23,190; the remaining 25% earned more than $23,190. 50% of the employees received less than $20,250; the rest 50% received more than $20,250. 25% of CNAs were paid annual wages less than $17,710; 75% were paid more than $17,710. 10% of employees were offered less than $16,340; 90% were offered more than $16,340. The income of a certified nursing assistant fluctuates as per different geographical location. 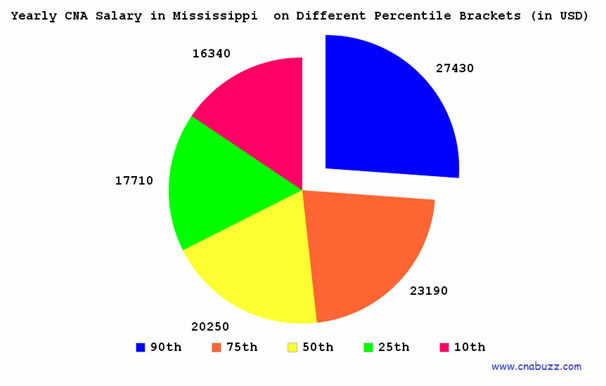 In the state of Mississippi, the salary figures vary in each city. Olive Branch and Southaven were the highest paying cities with median annual salary of $29,183. CNA working in Meridian city received the lowest salary ($22,987). The table below gives a list of all the job titles along with their specific salary in Mississippi. CNA Hospice received the highest income of $33,000 while Correctional Prison Facility CNA were paid the lowest salary, i.e. $16,000 as per the reports of indeed.com. The healthcare industry is booming day-by-day. CNA is the most prevalent entry level position in this sector. As per the BLS data, it is predicted that employment opportunities in this profession will increase by 21 percent in the upcoming years (2012-2022). This estimated growth rate is much faster as compared to all other occupations. Approximately 312,200 new openings for the nursing assistants will come up. Question 1 – I’ll be completing my certification in a few months. I wanted to know the top paying job titles in this profession. Can anyone help me out? Answer – Some of the top paying job titles in this profession include CNA Hospice ($33,000), CNA Rrmc ($31,000), and Medical Assistant Family Practice ($30,000). Question 2 – Currently, I’m working as a CNA in Meridian, but willing to move to Biloxi in a couple of months. Is there any salary difference in both the cities of Mississippi? Answer – Meridian is the lowest paying city in the state while CNAs can earn up to $28,138 per year in Biloxi.